Bio: Born in Quirindi, N.S.W.in 1946, Lyn Mellady grew up in Sydney’s southern beach areas. In 1964, she was introduced to oils at teachers college and in 1966 she graduated with a distinction in art. In 1981, after being very involved with ballet, primary teaching, art education and raising a family, she gave her own artwork priority and she retired from teaching to paint full time. Lyn's work has won many dozens of awards, and commendations including Finalist in the International Pastel landscape Excellence Awards 2001. She appears in three art reference books including 50 Australian Artists. Her paintings are owned by corporate and private collectors on five continents. Lyn was President of The Australian Guild of Realist Artists in 2000 & 2001. During this term she was instrumental in establishing the annual Australian Art Excellence Medallion. Lyn is a Charter member of Landscape Artists International, Fusion Six, Pastel Society of Victoria, and Brushmen of the Bay, Councillor and Past President of the Australian Guild of Realist Artists. Navigation: The main menu remains available at all times, either at the top or the bottom of the page. Navigation would be more user-friendly if it stayed put. Image View: Each gallery consists of large thumbnails. Labelling of these is inconsistent, both for dimensions and medium - the thumbnails do not enlarge, and Lyn’s realistic technique is such that to decide on whether painting is oil or pastel is a matter of guesswork. 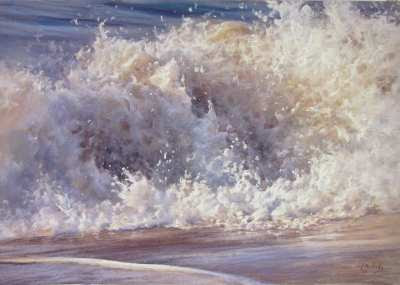 Splash is 46 x 67 cm.